The Phoenix and the Crow began its life as a series of travel notes towards the end of the nineteen nineties. I was travelling in a mountainous part of China, east of Chongqing, and had stopped off in a little town to spend the night. While taking an evening stroll through the streets, I came across a beautiful, long legged bird waiting in a bamboo cage outside a restaurant, next to other cages containing squirrels, rabbits, tortoises…I bought the bird, alive, and I even got the restaurant owner to put it in a sack. I took the 'bird in the bag' back to my hotel room. This is the basis of an incident in The Phoenix and the Crow but, unlike me, Wang Bin didn't manage to get back to the hotel with his 'bird in the bag', and that's where all his troubles began. Anyway, the next morning, I carried the bird in the sack on a long excursion by bus up to a lake in the mountains and while the other passengers were busy admiring the lake, I slipped away and released the bird in undergrowth some distance from the path. But the bird just stood there on its spindly legs under the trees and made no attempt to fly away, despite my gesticulations. The whole scene was becoming farcical, but it did not appear to me to be at all funny at the time. There was an urgency for me to get back to the bus, so I just left the bird standing where it was. It was on the long bus ride back into town the idea of a story about a mountain phoenix was born. In fact, the original title I gave the story all those years ago was The Mountain Phoenix, and the original draft ended before there was even any mention of the crow. But when I started revising the manuscript a couple of years after the first version was finished, I felt there was a need for the book to be more balanced, or rather more in line with my rather optimistic view about life and how individuals should react when confronted with misfortune and setbacks. And so I introduced an ugly black crow to counterbalance the immaculately beautiful phoenix, and let the story unravel from there. The stories I write always start from an initial spark of truth which is then moulded into something grossly unreal. The challenge is to make the stories appear to be real, to bring the readers to a point where they actually believe that what is happening in the story is happening in real life. And once the writer gets his readers on the same wavelength as the storyline, the storyline can develop in any direction, become ever more preposterous, and draw the readers into the adventure as though they, too, were characters in the novel. If the author can achieve this, then I think he has done a good job. 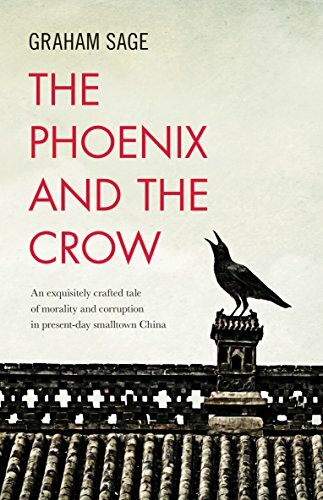 Details: The Phoenix and the Crow is published by Monsoon Books. It will be available from November, in paperback and eBook, priced in local currencies.